Apo-Prednisone (Prednisone) is an orally administered synthetic corticosteroid medication that exhibits glucocorticoid properties. It has a wide range of medical uses due to its strong anti-inflammatory benefits. Indications can include, but are not limited to allergic conditions (asthma, dermatitis and rhinitis), skin disorders (mycosis fungoides, bullous dermatitis herpetiformis), lupus erythematosus, adrenocortical insufficiency and other related disorders, ulcerative colitis and other gastrointestinal conditions, blood disorders, certain types of lymphomas or leukaemia, multiple sclerosis, eye conditions which have failed to respond to topical treatment, breathing conditions, various forms of arthritis (rheumatoid, psoriatic, ankylosing spondylitis) and other conditions. This adrenocortical medication blocks the chemicals used by the immune system in reactions that produce inflammation, thereby helping to decrease swelling. Its method of action for other conditions may be due to its effects on protein catabolism, fat synthesis and its triggering of gluconeogenisis. 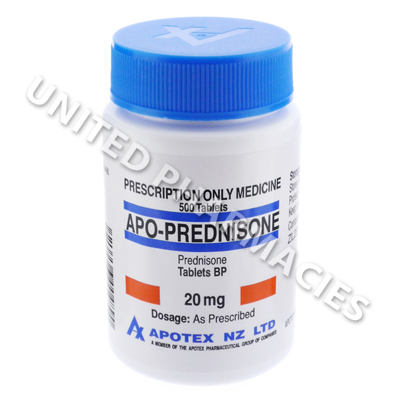 Apo-Prednisone (Prednisone) comes in the form of 20mg tablets for administration via the oral route. The amount of medicine required, as well as the strength of tablet used will depend largely on the reason why it is being used. Vastly differing doses are used to reflect the wide range of disorders treated with this corticosteroid medicine. If used as an anti-inflammatory medicine, the dosage used generally ranges from 5mg to 60mg, taken 1 to 4 times per day. Patient specific instructions will be given by the doctor. Nephrotic syndrome, psoriasis, skin disorders or any other conditions might need a different dosage regimen. You must only administer the amount of medicine that your doctor tells you to take. Troublesome side effects need to be reported to the doctor in charge of medical care. Hospitalisation or medical care is necessary at the first sign of serious side effects, including coughing blood, seizures, symptoms related to the eyes, signs of pancreatitis, high blood pressure and any other serious reactions that have not been mentioned here. Stay away from anybody is sick or infected, as this medicine can make you more vulnerable to infections, and if you do suffer from an infection while taking this medicine, it could be serious. Oral corticosteroid therapy may have an effect on the mood of the patient. If you experience strange behaviour during treatment, see your doctor straight away. Always use Apo-Prednisone (Prednisone) as you have been prescribed by your doctor. Never self-medicate or change your dosage without first consulting your doctor. The correct dosage can vary depending on your health, medical history, and the severity of the condition being treated.